This upcoming handset is expected to hit the market with a MediaTek MT6755 processor on board, next to 4 GB RAM, 64 GB internal storage, and a dual-camera setup, all with Android 7.0 Nougat on top. Gionee is apparently another Chinese company ready to launch a dual-camera handset to target the mid-range sector of the market. Dubbed S10, this smartphone has recently leaked in a set of clear images that show rose gold, blue, black, and metallic green color options. 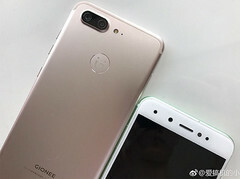 Although Gionee still has to confirm these specs, the rumors revealed the following so far: MediaTek MT6755 processor, 4 GB RAM, 64 GB internal storage, 5.5-inch full HD display, a battery with a capacity ranging from 3,100 mAh to 3,700 mAh (depending on the leak that revealed it), micro USB instead of USB Type-C, 3.5 mm audio jack. The operating system installed would be Android 7.0 Nougat. In addition to the above, there is at least a dual-camera setup on the back, some sources claiming the front camera setup is similar. Sadly, there is no detailed information about the cameras at this time. However, the Gionee S10 is expected to be unveiled soon, so stay tuned for all the details.